Episode Review: GLEE, "Dynamic Duets"
It's a shame that FOX decided to air "Dynamic Duets" on Thanksgiving night because it was one of the better episodes of Season 4 if not the entire series. Let's just hope the network doesn't punish Glee for its own mishaps. 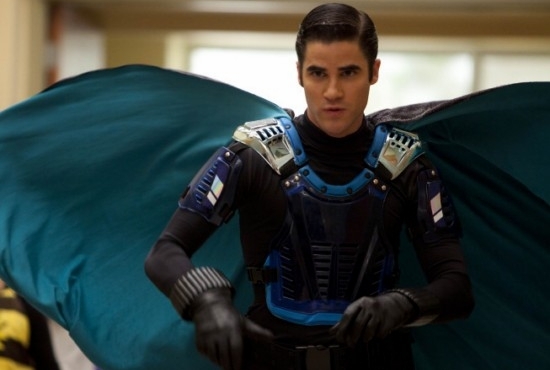 Blaine continued to fill the void left by Kurt by creating a club for wannabe superheroes. During one of the Secret Society of Superheroes meetings, Dottie Kazatori alerted the group about an emergency in the choir room. Once there, they found a lap top where their Nationals trophy used to be, and after playing the video it was revealed that the Warblers had stolen the hardware to psych out New Directions prior to Sectionals. Blaine (aka Nightbird) took it upon himself to get the trophy back from his old team, but as it turned out the theft was a ruse orchestrated by the Warblers new captain, Hunter Clarington, to get Blaine back at Dalton. He tried to convince Blaine that he didn't belong at McKinley and he should come back home. The manipulation worked, and Blaine was ready to put the blazer back on once and for all, but Sam stepped in and convinced him that McKinley was his home and that he needed to forgive himself for what he did to Kurt. While Blaine was dealing with the Warblers, Finn had to prove that he could be New Directions' hero. After his first idea for Sectionals was shot down (he wanted to sing all Foreigner songs in foreign language while dressed in traditional costumes), he decided to join in on the superhero fun and became the Treble Clef. His first mission was to mold the glee club into a team by turning foes into friends, so he made Ryder, Jake, Marley and Kitty sing duets with their mortal enemies. Jake and Ryder were not able to stand each other long enough to finish "Superman," so Finn took a different approach. He had them share their biggest fears with one another. Jake admitted that he doesn't fit in since he's bi-racial, and Ryder came clean about not being able to read. Pukerman felt the need to let Finn know what was going on with Ryder, and he helped Ryder get tested for any learning disabilities. Meanwhile, Kitty pretended to have Marley's best interests at heart but she continued her assault on her rivals body image issues. On the surface, an episode like "Dynamic Duets" probably shouldn't have worked, but when you think about it superheroes are the perfect theme for a show like Glee because the genre can be over-the-top and requires a certain amount of suspension of belief much like the show itself. But what made "Dynamic Duets" work wasn't the costumes or the comic book references. The reason why the episode was successful was because it was able to effectively use the theme to allow us to learn more about the characters. Sure, it was fun watching everyone dressed up in tights, but the superhero motif allowed to glee clubbers to unmask themselves and expose their deepest insecurities. Granted, that's Glee's bread and butter and we've seen it all before, but using a new approach so well made for a very entertaining installment. Like always, it wasn't perfect though and there were a few mishaps that irked me ever so slightly. For one, I wasn't thrilled with how the newest love quadrangle's being developed. Marley immediately going to Jake after Ryder had to cancel their date didn't quite work for me, and if felt out of character despite the fact that she did so because of Kitty's meddling. I suppose it was funny that Kitty's plan backfired, but something about Marley juggling two guys was off-putting. Ditto for Jake's continued pursuit of her even though he buried the hatchet with Ryder. That move squandered any good will he cultivated during the episode. That said, I am more interested in the romantic misgivings of these four than I was by the original's, but I do wish the writers were giving us something new rather than a slightly better retread. Tina really need to drop the attitude. At this point, I hope she never gets a solo. Finn's been impressive as the new leader of the choir, but I would've liked to see him struggle a little bit more. Hunter as a Bond villain and the Warblers as his minions was pretty great. The only thing better was Sam as Bane. Perfection. As a multi-racial person, I could really relate to Jake and I hope the show really runs with his back story. Blake Jenner proved why he won The Glee Project. Once again, I didn't miss NYC at all. "I think it's that the glee club doesn't see me as an adult. Ugh, god! Is that what coffee tastes like? How do people drink that?" "Dynamic Duets" was a reminder of how good Glee can be when it really wants to. We got the themes, the music, the relationship drama and the wackiness, but none of it felt forced or scattered like some previous episodes. It was just fun from start to finish.